On Sunday night, after one of the most unlikely title-game comebacks in American sports history, the field at NRG Stadium in Houston was a mess. Exhausted players and coaches embraced each other in awe as confetti stuck to their sweat-drenched faces. Photographers, festooned with league credentials, jockeyed for position around the game’s stars. The stunned Atlanta Falcons trickled back to their locker room as cats across the country celebrated the defeat of these dirty birds. And the grounds crew rushed to build a platform where, for the fifth time, the NFL season would conclude with the anointment of the New England Patriots as champions. Amid the chaos, league commissioner Roger Goodell went looking for a handshake. This was supposedly the NFL sheriff’s moment of ignominy. Over the past two years, Goodell had spearheaded a scientifically dubious crusade against Tom Brady—the air-pressure scandal known as Deflerpnerpppp. Then Brady served his fraudulent suspension and won anyway. He was the MVP of Super Bowl LI, which meant Goodell would be forced to hand shiny hardware to Brady and his team, as sports columnists had hypothesized and New Englanders had fantasized. Still, despite this imminent humiliation, Goodell wanted to shake Brady’s hand. He found the newly minted five-time champ in the crowd and slapped the quarterback’s arm to get his attention. “That was awesome,” Goodell said (as best I can tell by reading lips from the Fox broadcast and a different angle captured by NFL Films). “Thanks, appreciate it” Brady replied with a curt nod. “Great football game,” Goodell seemed to say as he pulled away. It was a banal exchange, but the circumstances made it extraordinary—as evidenced by the wide-eyed expression on the face of sportscaster Jim Gray, standing inches away. When Goodell took the podium minutes later to hand the Lombardi Trophy to Patriots owner Robert Kraft, the New England partisans in the stands booed him with vigor. And I hurled some obscenities of my own from home, which I’m sure hurt Roger’s feelings very much. 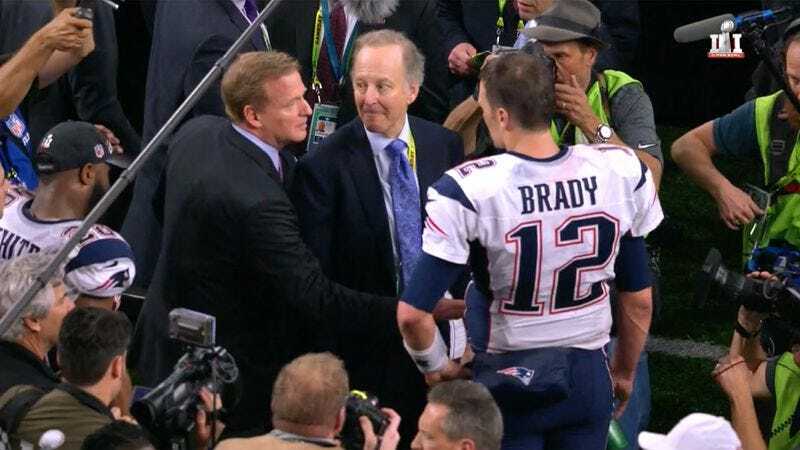 But after the festivities died down, the image of Goodell that stuck with me was the handshake. The commish was under no obligation to track down Brady in the crowd; it was just a decent thing to do. Plus, Goodell was right: That was awesome. I love sports for the same reason I love all games. They are storytelling machines, and you never know what the story is going to be until you play. And if you’re into stories, as I think most A.V. Club readers are, then watching or playing a game is like unwrapping a surprise. We love to guess what’s in the box. We spend the two weeks before every Super Bowl telling our own tales of how the matchup will go. Almost without fail, the actual game defies our predictions. The game mocks us for pretending that we could possibly understand the twists of fate. Sports fans wouldn’t have it any other way. In its 51st iteration, the Super Bowl told a story that nobody could have guessed, a story unlike any it has told before or will tell again. This contest defied even its own expectations: The score of 28-3 was a clear message of doom for the hated Patriots. We all interpreted it as such, except for the Patriots themselves, who recast that deficit as a mere prologue to their return from the dead. The iconic play of Super Bowl LI, New England wide receiver Julian Edelman’s fourth-quarter catch, captured the dynamics of the game in one ludicrous instant. After Brady’s pass was tipped, Edelman leaped between the spinning limbs of three Atlanta defenders to grab the ball, let go of it in midair, and secured it again before it hit the ground. The replays of the catch have a surreal quality. You can watch the slow-motion footage a hundred times, and every time it seems certain that gravity will win out. Somehow it doesn’t. So it went for the Patriots. New England’s chances for victory never quite fell to the ground. Instead, for a long stretch in the middle of the game, they hovered at the edge of the possible. After James White converted a two-point try to make the score 28-20, a New England win reentered the realm of the plausible. And when the Pats won the overtime coin flip, all of a sudden their victory was probable. Taking the game’s 60-plus minutes as a whole, it may not have been the most exciting Super Bowl, but its narrative arc was the most extraordinary. It told one hell of a story. “Hell” was the operative word there for many viewers, because the Patriots make such fantastic villains for those who root against them. In the fourth quarter, the televisual avatar for Falcons fans and their bandwagon-jumpers was team owner Arthur Blank. The Falcons honcho had descended from his luxury box in anticipation of a party he had waited 15 years to see (having bought the team in 2002). Every time Fox cut to Blank—which was many times, because Fox loves to zoom in on agony—he looked a little more like Gomez Addams watching a thresher eat Cousin Itt. It was impossible not to have your heart break a little upon seeing that Blank stare. That is, unless you were Tom Brady, for whom the story couldn’t have unfolded any more sweetly. I call Brady the “handsome hero quarterback” in this column to mock my own fandom, but my underlying admiration for the consummate competitor is real. As a fan, the Brady I perceive is, naturally, different from what his detractors see. On Sunday, I watched Tom Brady with my memory still fresh of his Super Bowl media day appearance—specifically, the moment when a 7-year-old kid asked him to name his personal hero. Brady replied, “My dad,” and he started to explain before he stopped short in a half-successful effort to hold back his tears. I watched Brady face a 25-point deficit with the knowledge that his mom was attending her first game of the season amid a fight against cancer that, we recently learned, has been raging for some time now. Brady isn’t often one to complain—except to the officials, who are routinely harangued by the fiery quarterback—but he allowed last week that it has been “a challenging year for my family.” He spoke with the guardedness of someone who’s had the experience, the bewildering torture, of being turned into a mass-media caricature. After the game, Brady dropped to his knees twice on his winding journey to the victors’ podium, holding his head to brace himself against waves of emotion as teammates and friends swarmed him to lend their strength. Standing on the stage after the trophy presentation, he was too exhausted to keep his guard up anymore, so his face betrayed the mixture of triumph, relief, and anguish in his heart. Tom Brady had bigger things on his mind than the Super Bowl, as we all do, and still he went out there and put on a competitive display for the ages. Perhaps with so many actual villains working right now to destroy our society, Brady doesn’t need to be made into your villain today, just like I don’t need to make Roger Goodell into mine. You give up nothing by sharing in Brady’s melancholy joy for just a moment, and you gain the salutary effects of compassion. Plus, you can go right back to despising him next week, when he bakes a pancake breakfast for Trump or some such. It’s possible, after all, to “hate” the character Brady plays in the manufactured narrative of pro football while maintaining sympathy for the human being that we know is in there—even if Brady assiduously hides that humanity from view, out of self-protective habit. Pro football is rife with contradictions like this. It showcases brutality, as seen in the ferocious mash of linesmen, alongside grace, as witnessed in the exquisite kinetics of a Julio Jones sideline catch. It can be seen as a largely static game, full of waiting, yet its action bursts with such frenzied energy that we have to slow the motion down on video to make sense of all the moving parts. Football’s most delightful contrast, though, is its juxtaposition of rage and love. This is an angry, snarling, zero-sum game, yet it’s also a place where musclebound, über-masculine players openly express their love for each other. Inside The NFL’s recap of Super Bowl LI, for instance, concluded with a montage in which the New England Patriots declared their devotion to everyone in sight. “I love you guys! I love you guys!” shouted Patriots head coach Bill Belichick as he hugged Brady and running back LeGarrette Blount. There is a heart under that hoodie, and it grew three sizes that day. Even the postgame shows were filled with love. NFL Network commentator LaDainian Tomlinson spent the tail end of his segment razzing his colleague Deion Sanders over Deion’s multiple, conflicting picks in the lead-up to the Super Bowl. But it was a warm-hearted ribbing, and Sanders responded by proclaiming his big-brotherly affection for Tomlinson, who had just earned a spot in the Pro Football Hall Of Fame. As you can probably tell by the tenor of the column lately, I’m a sucker for scenes like this right now. In the present cultural moment, animosity is the low-hanging fruit. It surrounds us. Love is harder to discern. For our own sanity and well-being, we have to seek out the opportunities to love each other, even when we’re operating in a savage milieu like football. Especially then. That’s a wrap for Block & Tackle this season. It’s a distinct pleasure to write for my readers, who are nice and funny and cool and bring me a lot of joy. I’d also like to tip my cap to the copy desk, in particular Caitlin PenzeyMoog, who has read through most of the columns this year even though, to my knowledge, she doesn’t have a shred of interest in professional football. Neither does my wife, Anna, but she let me sleep in every Friday—managing the morning craziness of a 1-year-old boy on her own—after I would stay up way too late on Thursday night making GIFs and the like. As for me, I’m about to host a TV show! Cool, right? The show is ramping up fast, and I should be able to share more details soon, once the network decides it is okay for me to tell you all about it. (They want to preserve the secret just a little bit longer to savor that special intimacy between host and network.) So I’ll see you again before long, whether in these pages or on your television screen. Thanks for your support this season. I love you guys.